Help children get to know Jesus by studying the events of His life. Using one of our timeline activities below, you can create a wonderful addition to your religious studies program in the classroom or at home. As each event is highlighted, discussed, and added to the timeline, children become more familiar with the beauty and characteristics of our Lord. This activity can be the perfect companion to the Liturgical Year. Plus each event featured in our Little Timeline of the Life of Christ or the Life of Christ Timeline for Children comes with an accompanying worksheet or full notebooking set that exactly matches the images in the timeline. *Please note that our Preschool Life of Christ Timeline does not include activity sheets at this time. Which of our timeline activities is right for you and your students? Colorful child-friendly 3-D Graphics are used. Over-sized timeline pieces are suitable for classroom or bulletin board use. Pieces can be used as discussion starters. Blank timeline pieces are included to add additional events to the timeline. Colorful child-friendly graphics are used. Standard-sized pieces are suitable for classroom or small space use. Timeline pieces are labeled with complete sentences. 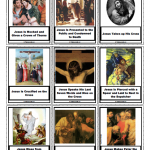 This printable resource pack is suitable to compliment any New Testament Bible study curriculum or many of events in the Liturgical Year. A narration style worksheet is available for each event presented – both with and without a coordinating color image. Classic art images are used. Scripture and artist reference sheet is included. This resource pack is suitable to use as a standalone program, as a complement to any New Testament Bible study curriculum or to accompany many of events in the Liturgical Year. A 16 page notebooking and worksheet set is available for each event presented. Packs include a variety of layouts and designs featuring opportunities to write as well as draw content. Line-spacing options include interlined to college ruled. 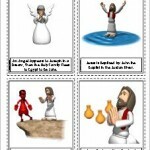 Our Preschool Life of Christ Timeline was created with the littlest Catholics in mind. 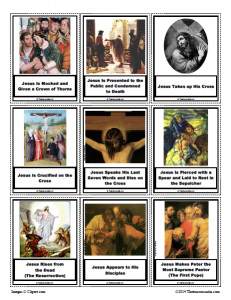 Perfect for Sunday School, preschools, very young intro CCD classes, or home use, this printable gem features 32 basic events in the life of Christ. Colorful child-friendly non-threatening 3-D graphics are used in this teaching tool. Parents and teachers can take comfort in the fact that tender hearts will not be stirred to nightmares with the crucifixion here! Events featured in this resource include the following as they appear in this activity. The Angel Gabriel Tells Mary That She Will Be the Mother of Jesus. Mary Tells Joseph That She Is Going to Have a Child. Mary Goes to Visit Her Cousin Elizabeth. Mary and Joseph Go to Bethlehem. There Is No Room for Them in the Inn. Jesus Is Born in a Stable. Mary Wraps Baby Jesus in Swaddling Cloths and Places Him in a Manger. Shepherds from the Fields Come to See and Adore Baby Jesus. Magi from the East Come Bringing Gifts to the Newborn King. An Angel Appears to Joseph in a Dream, Then the Holy Family Flees to Egypt to Be Safe. Jesus Is Baptized by John the Baptist in the Jordan River. Jesus Fasts in the Desert for Forty Days and Is Tempted by the Devil. Jesus Performs the Miracle of Changing Water into Wine at the Wedding at Cana. Jesus Teaches the People in Parables and Proclaims the Kingdom of God. Jesus Feeds the 5000 with Five Loaves and Two Fishes. Jesus Tells the Parable of the Good Shepherd. Jesus Raises Lazarus from the Dead. The Chief Priests and Scribes Plot Against Jesus. On Palm Sunday Jesus Enters Jerusalem Riding on a Donkey. Jesus Is Captured in the Garden by Roman Soldiers. Jesus Is Beaten and Crowned with Thorns. Jesus Takes up His Cross and Carries It to Calvary. Jesus Falls Because the Cross Is Very Heavy and He Is Very Weak. Simon of Cyrene Helps Jesus Carry His Cross for a Short Time. Jesus Dies on the Cross and Is Placed in a Tomb. Jesus Rises from the Dead on the Easter Sunday. Jesus Ascends and Goes Back to His Father in Heaven. The Church Begins to Spread All over the World. The Life of Christ Timeline for Children features 57 different events in the life of Christ as well as the formation of the early Church. Colorful cartoon style images are used in the descriptive timeline pieces. Matching worksheets are available for each event. Download the timeline and matching bundled worksheets below. The Angel Gabriel Announces the Birth of Christ to the Virgin Mary. Mary Tells Joseph That She Is with Child. An Angel Visits Joseph in a Dream and Tells Him to Trust Mary. 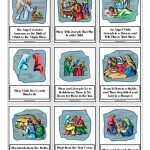 Mary and Joseph Go to Bethlehem; There Is No Room for Them in the Inn. Jesus Is Born in a Stable, Wrapped in Swaddling Cloths and Placed in a Manger. Shepherds from the Fields Come to See and Adore the Baby Jesus. Magi from the East Come to Pay Homage to the Newborn King. Mary and Joseph Present Jesus in the Temple. An Angel Appears to Joseph in a Dream, then the Holy Family Flees to Egypt. Jesus Is Found in the Temple After Three Days. John the Baptist Preaches and Baptizes, Preparing the Way for Jesus. Jesus Is Baptized by John the Baptist on the Banks of the River Jordan. Jesus Fasts in the Desert for Forty Days and Endures the Temptation of Satan. Jesus Calls His Disciples with the Miraculous Draught of Fishes. Jesus Performs the Miracle of Changing Water into Wine at the Wedding Feast at Cana. Jesus Raises the Son of the Widow Naim from the Dead. Jesus Forgives the Sinful Woman. Jesus Stills and Quiets the Tempest. Peter, James and John Witness the Transfiguration of Jesus. Jesus Teaches the Parable of the Good Samaritan. Jesus Visits the Home of Mary and Martha. Jesus Teaches the Parable of the Prodigal Son. Jesus Cures the Ten Lepers and Only One Returns to Thank Him. Jesus Heals the Man Blind from Birth. Jesus Meets Zacchaeus the Tax Collector. Jesus Cleanses the Temple of the Money Changers. Jesus Instructs on Paying Taxes to the Emperor. The Disciples Prepare for the Passover Meal. Jesus Washes the Feet of His Apostles at the Last Supper. Jesus Goes to Pray in the Garden. Jesus Returns from the Garden to Find His Disciples Sleeping. Jesus Is Seized in the Garden. At the Rooster’s Crow, Peter Remembers the Words of Jesus. Jesus Is Condemned and Sentenced to Death. Jesus Is Crucified, Dies On the Cross, and Is Placed in the Tomb. Jesus Appears to His Disciples and Gives Peter the Keys to Heaven. The Holy Spirit Descends on the Apostles. Mary Is Assumed into Heaven. Please note that this is a larger 9MB zipped file that may take some time to download in its entirety. You may choose to download the files individually from the link to the right. Our Little Timeline of the Life of Christ features 39 events in the life of Christ, timeline pieces showcasing famous works of art, plus matching notebooking and worksheets sets for each featured event. Events featured in this resource include the following as they appear in the activity. Please note that this is a very large 31MB zipped file that may take some time to download in its entirety. You may choose to download the files individually from the link to the right.